Last night was not a great night for our student group to be doing the second week of an all-church Bible study that has to be done at the same time as everyone else. Several guys arrived at my flat wanting to know if we could have the Arsenal match on ‘in the background’ (everyone knows there is no such thing as ‘in the background’ when it comes to football); I, on the other hand, was in a state of frenzy at the fact that while I was leading a meditation on Genesis 37, anyone not watching football was watching three women bake cakes and pies. This year’s GBBO final is the most watched of all the series – 8.4 million people watched last night (that’s more than X Factor apparently). It’s also been fiercely debated in the media and on social media. I had at least two fierce debates with people on Facebook yesterday about who should win – nothing terribly unusual about that, in competitive arenas people are always going to have their favourites. Just as the guys were desperate to see an Arsenal victory last night, I had strong views about who should win a national amateur cake baking competition. This year, I wasn’t overly keen on either Kimberley or Ruby – if pushed, I’d take Kimberley on her consistent technical skills – but I loved Frances’ creativity. One friend argued that she wanted Ruby to win ‘because she was so vulnerable and pocket-sized’, but last time I checked, vulnerability wasn’t a way of avoiding a soggy bottom. I wanted her to gain some confidence in her skills – to apologise a couple of times for what you think are terrible bakes (but it emerges aren’t) is fine; to do it consistently is not. Friends debated whether Kimberley appeared smug thanks to editing – but is simply saying that “I’ve baked this before” during a technical challenge really a sign of smugness? Surely it’s just stating fact? Opinions are fine – but not when they cross the line. What got interesting about this year’s competition is that so much of the criticism was in relation to the finalists’ gender and size. Last year, I don’t recall sexuality being used in such a way, even though 2 of the 3 finalists were openly gay. Why should female bakers still attract such ridiculous interest? Raymond Blanc waded in on the commentary to so helpfully deride the “female tears” on the show. (What are “female tears”, anyway? Are they more fragile and delicate than male tears? Do they wear pink?) Kimberley’s self-assurance – a character trait so lauded in men– has been rebranded as smugness, cockiness and even malice. It’s a culture of frilly baking versus macho Michelin stars, of real chefs versus domestic goddesses. Food has become divided and gendered, torn between the serious sport of haute cuisine and the supposedly antithetical world of women pottering around in home kitchens. I saw one male friend complain that the presence of 7 women to 1 man in the semi-final (that’s 1 male judge, 1 female judge, 2 presenters & 4 female contestants) was indicative of the assumption that baking was a female activity. Has he not seen the prevalence of male finalists in previous years? 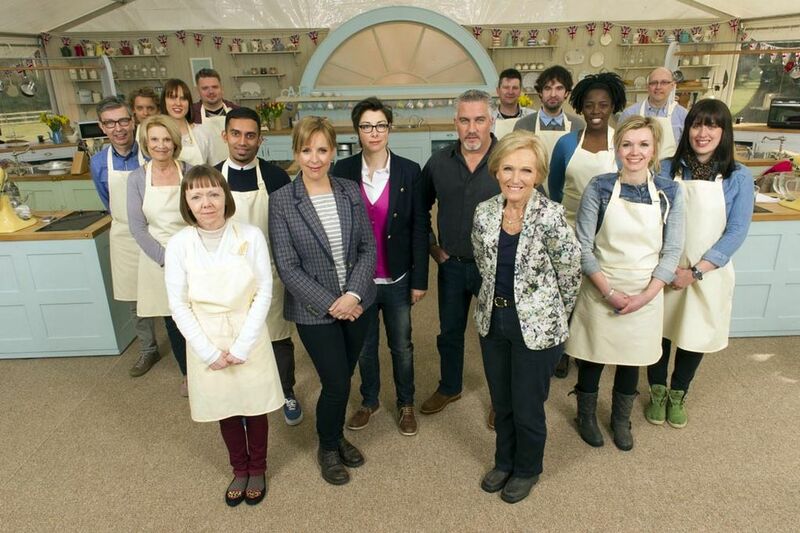 That the series is gender balanced to begin with and baking is judged on talent alone? 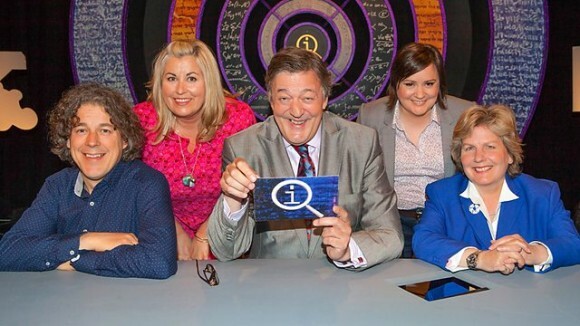 That seeing women outnumber men on a prime time TV show is still a flipping rarity in Britain?? Back to the Bake Off. I have a suggestion for the BBC (well two, see above idea of the James & Sue Baking Show). 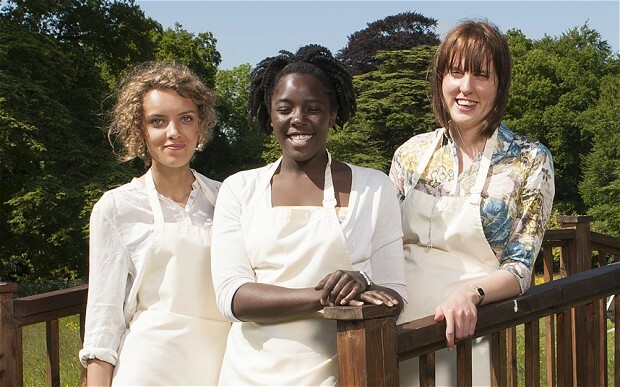 The Bake Off moves to BBC1 next year, now that it’s considered to be mainstream enough. So, how about we make a bit more of the final? This year, there was a rumour that the winner had been leaked – so avoiding a repeat of this would be ideal. A good way to do this would be to make the final a live one. It sounds ridiculous, I know, but actually perfectly doable. Have the same tents in Somerset, broadcast the day’s baking (perhaps just the showstopper) via the BBC’s red button so you can dip in and out whenever you want to. A friend even suggested multiple ‘oven cams’ so you could choose which cake you wanted to watch rising. Then at the end of the day, BBC1 could broadcast the judge’s decision live. Fabulous. What do you think, BBC? People walking too slowly (or in crowds) on London’s streets. Trolley cases. Improperly made tea. People who click ‘reply all’ when it’s really not necessary. You know, just the day to day issues of modern-day existence. On Twitter, I have one major pet peeve: the use of ‘@’ at the beginning of the tweet when it’s not actually intended to be a message to that individual. 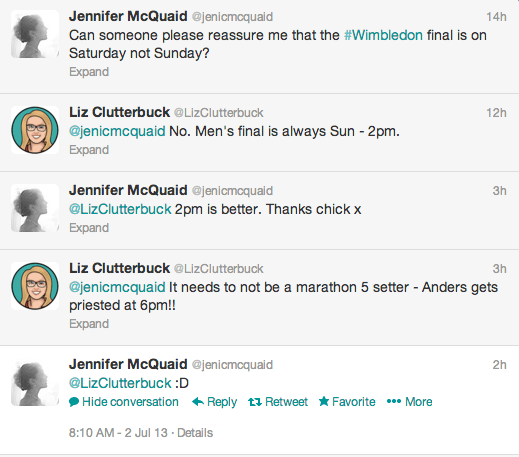 A Twitter chat with one of my favourite soon-to-be lady vicars – obviously making a massive presumption that we’ll have good reason to be watching the men’s final on Sunday! The key thing to understand is that when a tweet begins with someone’s username, only people who follow the author and the recipient will see it in their timeline. In this case, that probably means a load of fellow ordinands and mutual friends. [As an aside, I often forget to think about who follows who, which has resulted in some slightly awkward Twitter moments. All tweets are public, unless they’re Direct Messages. It’s good to remember that!] This fact hilariously means that a number of people were privy to the Clutterbuck family annual Christmas decision making process last week – you learn a lot of useless info via Twitter sometimes! Anyway, my pet peeve is when people begin a tweet with an @, but actually intend it to be seen by all their followers – because they seem to be completely unaware that in including the username at the start, they’ve actually limited their audience! Unfortunately, it’s often churches that fall foul of this – especially when tweeting about Sunday sermons. [I should say straight away that St George’s has never made this mistake!] To illustrate, if a church tweeted: “@lizclutterbuck preached on forgiveness last Sunday. Listen to it here…” only people who followed both the church account and me would see it – which rather defeats the point of the exercise as presumably the church would have wanted all their followers to see it? I feel that I need to clarify that I don’t actually follow Radio 2, nor have I checked to see what kind of a lemon posset accident this was. What amazes me is how few regular Twitter users realise this. Last week, I was particularly incensed by an example of this from Lambeth Palace, featuring the Archbishop of Canterbury. [Interestingly, when I went searching for it just now, it had disappeared and recent evidence suggests that they’ve realised the problem.] I tweeted something about the issue and had several replies of surprise from other Tweeters. This blogpost is a direct result of that tweet as I’ve discovered it’s a phenomenally difficult issue to fit into 140 characters!! I was struggling to find a way of saying ‘accounts that ought to know better – i.e. verified ones’, but could only come up with ‘big’ to fit into a tweet! This is in NO way an attack on accounts that have fallen victim to this! Like I said, many people are totally unaware of it. What annoys me is that it means that their tweets aren’t getting the audience they deserve! So, what’s the solution? Well, the easiest and least expensive in terms of characters is the full-stop – simply placing it before the @ will ensure that all your followers will see it. However, I personally try not to use it because I like tweets that are a little more poetic! You can re-work your sentence to ensure that the mention comes mid-way through the tweet rather than at the start. Or, you could put some kind of title in – which is the line Lambeth seems to have taken as their tweets often now begin with: “Archbishop @ABCJustin…”. It doesn’t really matter how you do it, as long as you realise that it needs to be done. Spread the word! Twitter – a great tool, as long as you know how to use it! My name is Liz and I am a tea-aholic. It’s under control and I have no need of an intervention. Honest. 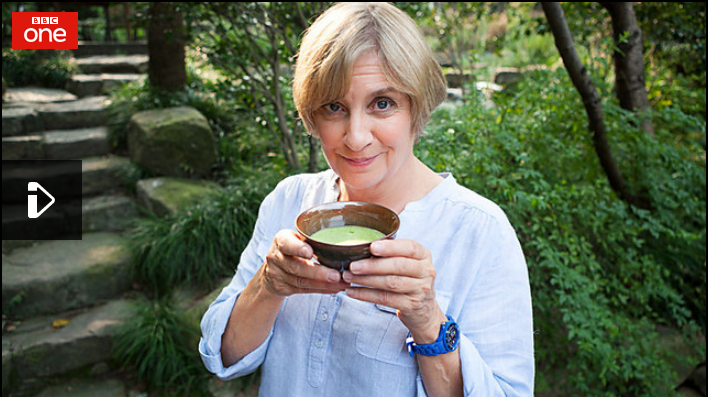 Obviously, this means that discovering the BBC was showing a two-part documentary on the history of tea was greeted with much joy – coupled with rejoicing at the news that Victoria Wood was presenting it. 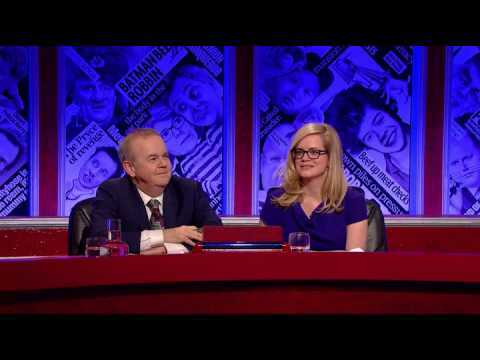 Tea and one of Britain’s funniest women? Yes please! The documentary is worth watching (you’ve got a few days left to catch it on iPlayer). True, the first part – exploring the role of tea in the empire – did lack some of the finer nuances of imperial history and Britain’s relationship with the people it governed. [Thus speaks the imperial historian…] The second part looked at the role of tea in British society, revealing who it was who came up with the concept of afternoon tea (the Duchess of Bedford) and why tea is now under threat from the rise of coffee. [Coffee will never overtake tea in my world. Love the smell, hate the taste. I thank my superior taste buds.] I made a categorical error in my watching of the second episode. It accompanied a long bubble bath and stupid me didn’t think to make myself a cuppa before lowering myself into the water. Essentially, the message was that for Brits especially, little competes with “a nice cup of tea” and that the ritual of making such a beverage – the boiling of water; warming of the pot; brewing of leaves; correct ratio of milk to tea; and the process of consuming it – are a centrepiece of society. 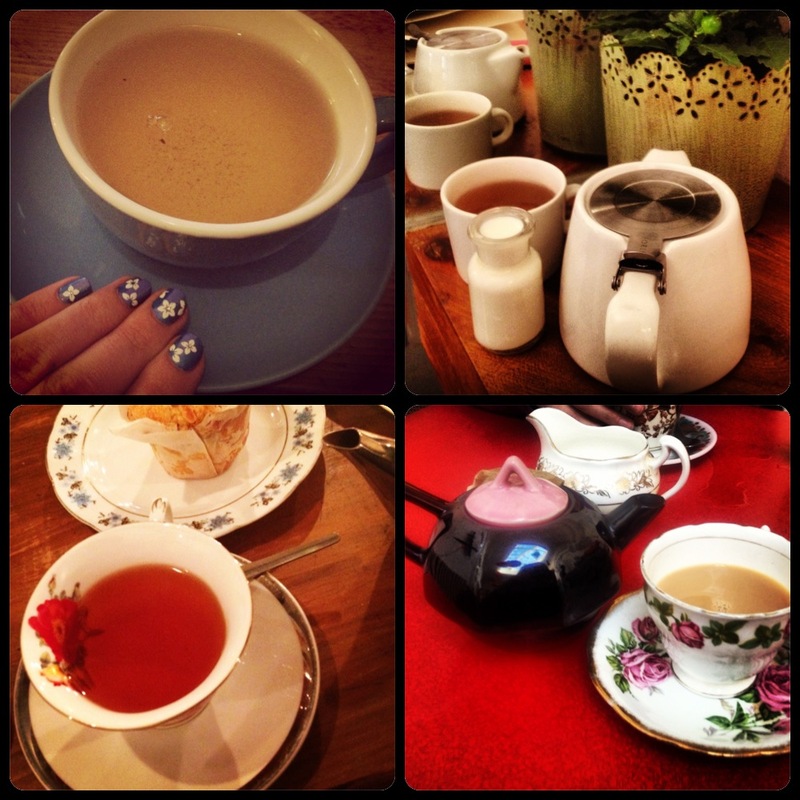 Plus, tea-addicts will go to great lengths to get the ‘right’ tea. I don’t have a particular brand loyalty (shocking) but I have had to carry PG Tips half-way across the world to satisfy the cravings of my American Anglophile friend Ian. It’s kitsch, it’s almost try-hard retro and it can be pricey (for this reason I’ve never partaken of their cake) but it has a marvellous tea-list, terrific motley china and has fun activities of an evening. (I went there last year for an alcoholic beverage and ended up making and decorating a cardboard 2CV while drinking a glass of wine. Awesome.) Plus, its proximity to King’s Cross makes it an amazingly convenient location for meeting people and it’s where I have as many of my meetings with one of my favourite student work colleagues as possible. In picturesque Richmond, this is the place to do tea. An amazing tea list and a genius device with which to time brews – it’s worth a trek out there for a visit alone. If Richmond isn’t quite posh enough for you, head to nearby Barnes. The Orange Pekoe has an even longer tea list (I think) and a fabulous atmosphere. Tea connoisseurs rate it highly. Finally, if you can’t make it to any of the above, treat yourself to some decent loose-leaf stuff and recreate the experience in the comfort of your own home. My top-tip is Suki Tea – a company that first sold its products at a stall in St George’s Market in Belfast, from which my mother would buy supplies to send to her tea-aholic daughters. 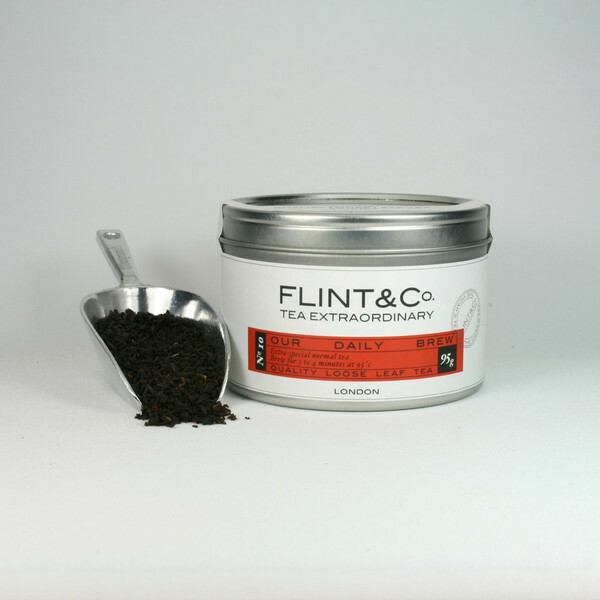 Delightfully, this is now available in cafes in London (I’ve discovered it at the lovely Tinderbox on Upper St, where I drank their Earl Grey Blue Flower this very evening) and online. Hunt it out! Let this be an encouragement to you to re-examine your tea drinking. Take time to make your daily brew in the proper fashion. Try a different blend or tea-drinking establishment. Buy yourself a decent teapot. Most of all, enjoy it. Or, in fact, get running in the first place. This April will mark a decade since I took up running. I had decided to get fit and my next door neighbour decided we would sign up for a Race for Life 5k and she’d train us (i.e. me and my sister – I had significantly more training to do than she did). I had long believed that Clutterbucks did not run, but over the year and a bit that followed, I discovered this wasn’t true. In fact, learning to run became an instrumental factor in my subsequent loss of 5 stone (there’s a story there, but for another time). We began alternating running and walking between the lampposts of Gloucester park, adding in longer runs as the weeks went on. When the 5k came round that July, I ran/walked it. A year later, I ran the whole thing in around 25 minutes. Two months later, I developed severe tendonitis in my ankles and running was a no-go. Yesterday, I went for my first outdoor run in over two years. (I vividly remember the last one as there was an unfortunate underwear related tweeting incident as a result…) Over time, I’ve discovered that I’m someone who needs to exercise very regularly in order to stay in some kind of shape and to keep myself generally cheerful. When I had a decently paid job, I had an indecently priced gym membership and went regularly. I became a pilates devotee. I swam. I cross-trained. Since starting vicar school, that’s had to stop. Instead I’ve walked insane distances across London (Monday afternoon’s post college stroll from Gloucester Road to Bloomsbury is a favourite), but it’s not enough. So, I did what any logical 21st Century person would do – I bought an iPhone app. 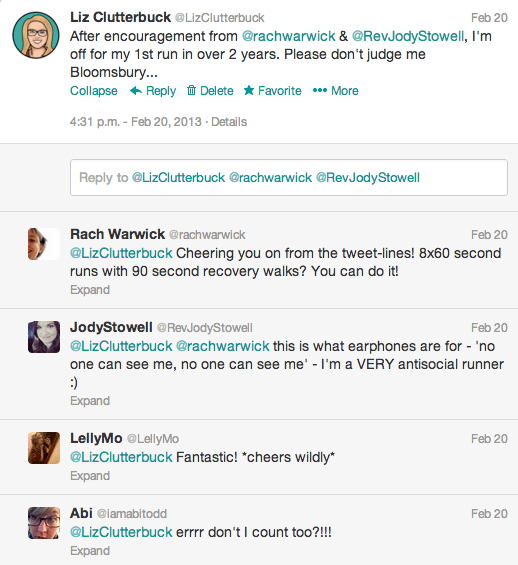 There are myriad options, but I went for the Get Running couch to 5k one (it had the best reviews). It works on the lamppost principle of old – mixing walking with running and gradually increasing the latter while reducing the former. You can play your own music and your instructions simply fade in and out, which is an awful lot easier than having to keep checking your phone (or digital watch, as was the case back in the day). It was fine. There was a rough patch in the middle, but ultimately it was ok. I didn’t bump into anyone I know (flipping miracle these days), although I did nearly get locked in the square – how was I supposed to know that the ringing of a bell in full daylight (at 5pm – hoorah!) meant the gates were being locked? I’m going to have to hold myself accountable to Twitter. Tomorrow morning should see run 2 of week 1 – I’ll then obviously have to have a bit of a break while in Uganda, as there’s no way I’m going running in 30+C heat. If you don’t hear me mention my running exploits again, feel free to take me to task. I’ll appreciate it. Honest.